by Michele Howe, Author of Empty Nest, What’s Next? Celebrate. Take some time to reminisce about the last eighteen years and how you raised a child that is prepared to enter the wider world without your daily presence. Give thanks to God for the opportunities your child will get to experience “flying solo” during their first journey away from home. Anticipate. Help your child to get excited about the positive aspects of stepping into the college experience. Remember that your son/daughter might very well be simultaneously excited and scared about the unknowns of college life. Take time to talk about whatever aspects of this new chapter in life your child needs to discuss and remind him that God is always with him and you are only a text/email/phone call away. Delegate. When your child is preparing for college (whether it’s a local college or states away) there is a laundry list of tasks to be completed. Make a master list of what needs to be done and put the deadlines on the family calendar. Then, break down the imposing list into smaller segments and involve the entire family in completing it. Don’t underestimate. Whenever a beloved family member leaves the home, it may feel sad. This period of grief may last a few days, weeks, or even months. Expect your emotions to run the gamut during those early weeks when your child first leaves. Don’t deny your grief, but don’t get stuck in it either. Concentrate. On the positives that come with change in life. Don’t wish away today’s changes by pining away for earlier parenting days. Be realistic by remembering that every stage of life has its ups and downs. Give thanks for today’s grace to handle today’s challenges. Meditate. Start memorizing and meditating on God’s Word before you need it. Look up verses that speak of God’s protection, provision, grace, and endurance for you (and your child). Share them with your child as the need arises and remind yourself of God’s faithfulness hour by hour. Activate. Begin this new chapter of your family’s history by putting into place new traditions. Rather than mourning that fact that your college bound child won’t be around for every family celebration, institute fresh new ways to celebrate with your family and/or bring the festivities to your child’s new place of residence. Cultivate. A can-do mindset of creativity. Every new chapter of life is ripe with possibilities for you and your now adult child. Be the parent who embraces these changes with positivity and good grace. Refuse to speak negatively about your child’s upcoming college experience on any front. Be the best and most vocal cheerleader your child has in his life. Generate. Train yourself to respond with enthusiasm every time you begin to fret or harbor secret doubts about how life will be different without your child in the home. Focus on expecting the best…and help other family members to do the same. Motivate. On any particularly low moments, get up, get busy, and get accomplishing something to work off your emotional funk. Take purposeful and productive steps by expanding the use of your personal gifts and talents. Broaden your life by asking God how He would have you use your time and talents as an empty nester. 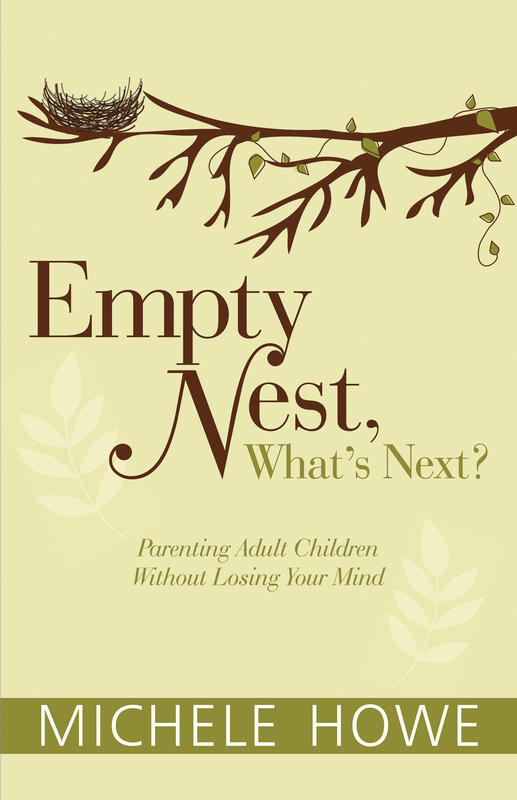 Michele Howe recently published Empty Nest, What’s Next?, a book dedicated to helping parents adjust to their changing roles as parents of adult children. Howe’s insights guide parents in the process of finding peace, freedom, and joy as they step into this new phase of life by offering true stories of other parents facing similar challenges, practical suggestions, encouragement, and a biblical model of parenting. In line with her passion for working with parents, Michele’s other books offer encouragement to men and women of all ages by challenging them to exercise their combination of strengths, skills, and life wisdom in pursuit of a healthy and fulfilling family and lifestyle. Recognizing that life is often difficult, both men and women can learn how to recognize (and find solace in) significant life-markers and by so doing, acquire the strength to embrace their daily challenges in Michele Howe’s numerous publications. Several of which include Going It Alone: Meeting the Challenges of Being a Single Mom, Still Going It Alone: Mothering with Faith and Finesse Once the Children Have Grown, and Burdens Do a Body Good: Meeting Life’s Challenges with Strength and Soul co-authored with orthopedic surgeon, Dr. Christopher A. Foetisch. To see a selection of her books, visit this link. ← Are You Doing Spiritual Work? Life is always in motion (and that’s a very good thing).